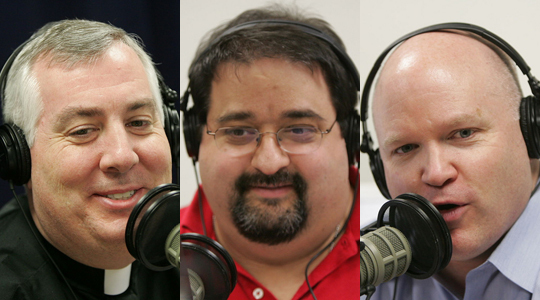 Summary of today’s show: Whether it’s in a media interview or at a Memorial Day barbecue, Catholics are often called upon to defend their faith. Scot Landry, Fr. Mark O’Connell, and Dom Bettinelli discuss Austin Ivereigh’s new book “How to Defend the Faith Without Raising Your Voice,” and especially his 10 principles of civil communication, so that all Catholics can give a good witness and avoid winning arguments at the expense of changing hearts and minds. 1st segment: Scot and Fr. Mark caught up on the last two weeks. Fr, Mark recalled Msgr. Frank Strahan’s story about singing before Pope John Paul II at a moment’s notice. We heard this story when Msgr. Strahan was on the show. 2nd segment: We all at some point represent the Church to our friends or families or coworkers to defend the faith. A new book by Austin Ivereigh covers these principles. Scot spent last weekend at a workshop with the author and others. We know how it feels, finding yourself suddenly appointed the spokesman for the Catholic Church while you’re standing at a photocopier, swigging a drink at the bar, or when a group of folks suddenly freezes, and all eyes fix on you. ‘‘You’re a Catholic, aren’t you?’’ someone says. ‘‘Um, yes,’’ you confess, looking up nervously at what now seems to resemble a lynch mob. What you’ll read in these pages is the result of a group of Catholics getting together to prepare themselves for precisely these high-pressure, get-to-the-heart-of-it-quick, kind of contexts: not just around the water-cooler, but in three-minute interviews on live television. Their experience, distilled here, will help you to ‘‘reframe’’ the hot-button issues which keep coming up in the news and provoke heated discussion. We call these issues ‘‘neuralgic’’ because they touch on nerve endings, those places in the body which, when pressed, cause people to squeal. In our public conversation, they are the points which lie on the borders where mainstream social thinking inhabits (at least apparently) a different universe from that of Catholics. Touch on them, and people get very annoyed. “How on earth can you believe that?” they ask you. So while we can’t predict the news story, we can be pretty sure about the neuralgic issues. This book helps you to think through ten of the most common (and the toughest) for yourself; to understand where the criticism is coming from; and to consider how to communicate the Church’s position in ways that do not accept the presuppositions of the criticism. At the end of each of the nine briefing chapters, there are some ‘‘key messages’’ which summarise these positions—and which will hopefully help you next time you’re challenged.